James was born at Ulm, and spent a fortunate childhood. He was thoroughly instructed both in his father’s trade of glass painting and in the practices of piety. He assisted his father in the making of stained glass, which was at the time a fine art in Germany, and he passed a sinless and happy youth in his native city. Wishing to make a pilgrimage to Rome, he asked his father’s blessing on the enterprise and set forth on his long journey, arriving in time to spend Lent in the holy city. Having run out of funds, James enlisted with the army in Sicily. Here his pious nature received a rude shock from the soldiers with whom he lived. They were given to every manner of vice and resented any effort to change their lives. Disgusted with the corrupt morals and practices around him, James made haste to free himself as soon as his enlisted was up. He went into service with a lawyer, who soon entrusted him with his most important affairs and would gladly have adopted him as his own son. Having worked with this man for several years, James became anxious to return home to see his aging father, so he once more set forth on the road. 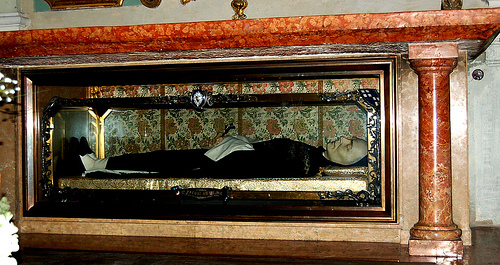 In Bologna, while he was praying before the tomb of Saint Dominic, an interior voice made known to him that his vocation was to be a Dominican. He sought no further, but went immediately to the prior to beg admission as a lay-brother in the Order. James set for himself no extraordinary program of sanctity when he entered the Order, but resolved to keep the rule perfectly. He did this with great success. His humility and obedience were particularly remarkable. James resumed his father’s trade of making stained-glass windows, and all his working time was devoted to making windows for the churches and convents that desired them. At one time, when he had a particularly large and elaborate window for firing in the furnace, the prior called for him to go out begging. Without a backward glance at his precious window, he went. He was gone all day, and it was only to be expected that his window would be in ashes when he returned, but God rewarded his obedience with a miracle-the window was more beautiful than he would ever hoped. On another occasion, the prior, who had been telling a visiting bishop of James’ virtue, called him and told him to take a letter to Paris- a journey of some three weeks. James, bowing his head, asked only that he might first go to his cell to get his walking stick. The prior did not send him: he had only wished to try his obedience. James was silent and recollected at his work, diligent and prayerful, and always ready to leave one kind of work for another when obedience called him, even though he had a craftsman’s regard for finishing for work well. His chief distinction was in keeping the rule perfectly, though he also performed a number of miracles. Two windows made by Blessed James are still in existence; one in the chapel of the Bentivoglio palace, the other in the cathedral of St. Petronius in Bloogna.